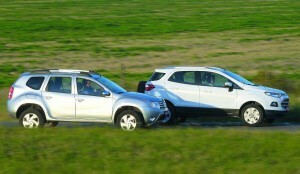 Ford EcoSport has again emerged out leader in Brazilian market when compared to Renault Duster. The American car maker sold 4,324 units of the car in Brazil while the French carmaker could manage just 1,212 units. Instead if you look closely at the nnumbers, you will recognize that the gap between the two cars is widening every month. However, in the month of January 2013, Ford EcoSport sold 6,367 units and Duster sold 3,695 units. EcoSport’s launch has eaten away into the Duster’s market share in Brazil by quite a margin despite the EcoSport being priced higher than the Duster.In India, the Ford EcoSport is expected to be launched at a lesser price as compared to Renault's Duster. It would not be a good option to comment any thing about two cars - in terms of which one will sell more in India, we will have to wait and watch at what happens when EcoSport is launched in India. Ford EcoSport will be displayed during a Supplier's meet at Chennai on 19th March 2013. As of now, we just know that Renault's Duster is a success story in India and has clocked more than 30,000 units since the time it was launched in India on 04th July 2012. View more details on comparison of two here.